Utilizing a quite drive Cushman DC industrial car with all steel construction, the Jib/Camera Car offers flexibility and efficiency for multi-location shoots. Equipped with a DC to AC power inverter, the Jib/Camera Car provides continuous power for the jib operator monitor, jib electronics, directors monitor and other small AC devices. 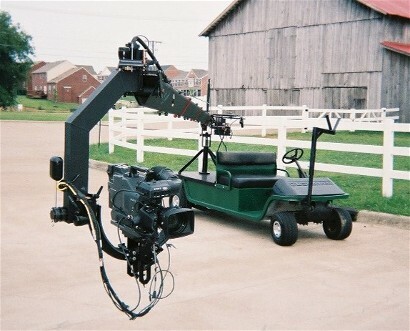 The Jib/Camera Car can be adapted for mounting video and film cameras as well as a Steadicam.